The Windows 7 Explorer default folder setting is a way to bring Windows 7 one step back closer to the way Explorer used to work in Windows Vista and XP. 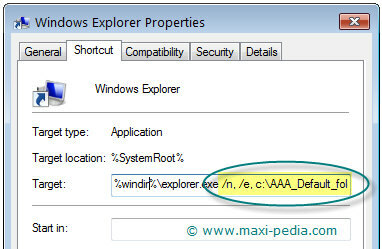 This guide explains how to change the default folder setting for Windows 7 Explorer. 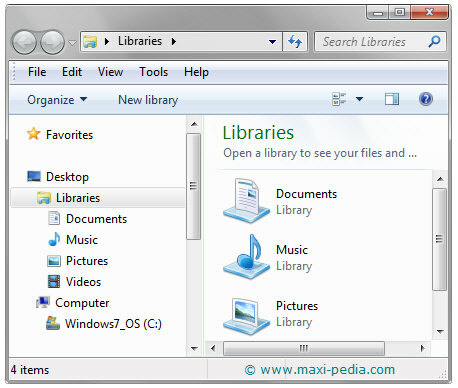 When you open Explorer in Windows 7, the default folder view is set to user’s Desktop -> Libraries. If you do not like to use Windows 7 libraries and keep your files in "other" location on the local drive, you need to manually browse to that location every time you open Windows 7 Explorer. This can be quite annoying after a while; therefore, it may be a good idea to change the Windows 7 Explorer default folder setting to the folder of your preference. Windows (Microsoft) assumes that users will make use of the default folder or library to manage their documents and files, and they make Windows Explorer open in the Desktop Libraries location by default. This however may not be convenient for everyone. The following print screen shows the default folder that opens up upon launching Windows Explorer. When you open a new instance of Windows Explorer, it defaults to the Libraries root (or in Windows Vista to the current user’s Documents folder which is located in Windows Vista at C:\Users\[current user]\Documents). If you are using another folder as the working folder and need to access different folder more often than the Libraries root or the default Documents folder, it is possible to change the Windows Explorer default folder setting and assign another folder as the default folder so that whenever Windows Explorer is started, it will display the contents of another different folder instead of the Windows preset folder. Changing the Windows 7 Explorer default folder is very easy. You need to modify the target property of the shortcut that launches the Explorer. If you launch Explorer from the default location which is Accessories, do the following. In case you have Windows Explorer pinned to the taskbar (in Windows 7), you still have to change the setting in Accessories. Windows 7 work a bit differently than Windows Vista. Windows Vista and XP allowed you to modify properties of shortcuts placed in taskbar; Windows 7 does not offer the ability to change taskbar shortcuts properties, and you have to make the modification at the source. 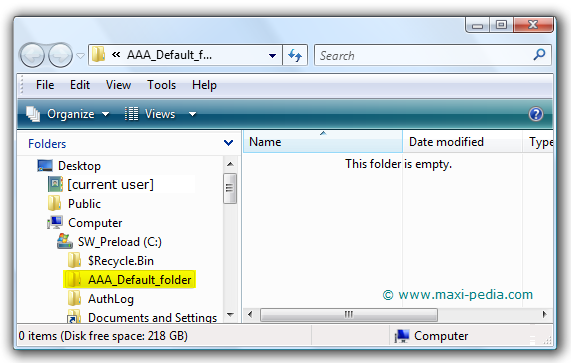 The C:\AAA_Default_folder\ is the location of the folder that you wish to set as the default folder for Windows Explorer. Replace the path per your preferences. The print screen above shows the setting for the default folder in Windows 7 Explorer. The next time you launch Explorer, it will open up with your new default folder expanded. The trick works on most Windows operating systems including Windows XP, Windows Vista, and Windows 7. There is a number of other settings that you can use for the explorer default folder.